My car pulled into the garage last night around 9:30pm. The leaves were just turning while Barb and I were in Spring Green, WI. What a wonderful trip we had!!! We really enjoyed Jeanne Horton of Country Sampler, her shop gals, Maggie, Stacie and all of the wonderful women who came to the retreat. Just wish we could have been there longer!!!! Thought you might like to see the latest Anniversary of the Heart pattern. This one will be at the printer tomorrow...so will be in the shops in 2-3 weeks. Barb did this one for her grand niece J.J. I love the puppy and the moth. Perfect for a sweet little girl! When I got home there was a couple of boxes waiting for me from Moda. Our newest fabric line has arrived ready for us to begin making some samples for market. I can hardly wait to begin working with this line! Will show you some pictures soon. 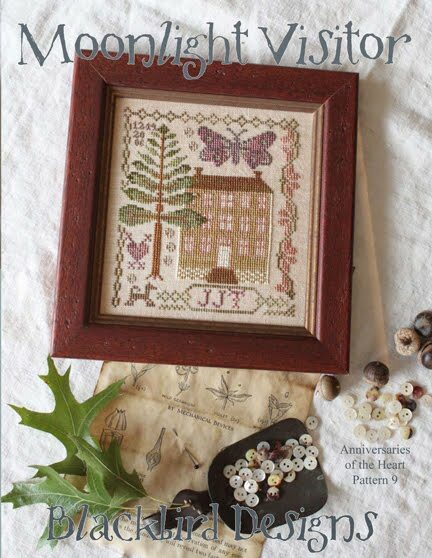 Wanted to let you know that we are going to release a book in Feb. with all of the cross stitch patterns from our class projects....so not to worry about missing out. Thinking of you all and hoping you are saving a bit of time to relax, stitch and enjoy the weather. I'll be in the front of the line for the new book. Can't wait. Thanks for putting that together for all of us that can't get to the classes. I love the latest piece, and yes, perfect for a little girl with that butterfly there. I know what you mean - there is something very sad about the last roses of summer. Of course, here in Australia, our roses are just covered in wonderful new leaves which are tinged with red - a promise of the summer to come. 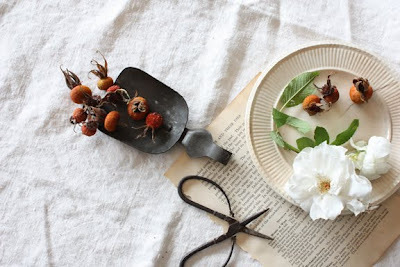 I hope there is no statute on the books for pinching rose hips! The latest piece is lovely! Moonlight Visitor is another great design! I especially like the little dog seeing I just recently got a dog. I am also looking forward to the book in Feb. to get the class pieces I missed. It was great seeing you and Barb again at the Country Sampler class! I sure will miss not seeing you at classes next year. I love the new AoTH. I am so excited about the cross stitch designs from the book for February. I always see the pics you post of them and want them, but haven't been able to attend anything yet. I hope the Quilt that you posted for Country Sampler retreat will also come out for those of us who missed out. It's gorgeous! Looking forward to the new publications - in particular that pomegranate applique in strong pastels really rings my bell! Would we ever give up on you two gals - no way! Love the new pattern, would make a nice gift too. BTW, love your fabric Wild Rose!! I love the new AotH sampler - and what a treat to look forward to in February! Glad you enjoyed your trip. Oooh, I love the latest AotH! Love the new fabric, too. I LOVE this one. Okay I love them all but this one really really calls my name. I am so so so happy that you are going to release the book of all your class projects in February. I have been looking, in vain, for a couple of them and now I will be able to stitch them. 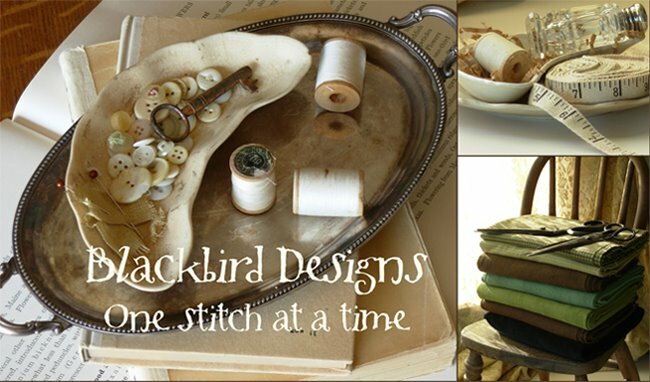 It isn't that I'm a Blackbird Designs addict or anything, not MUCH I'M NOT because I love all your fabrics too. And of course I host the Blackbird Designs Exchange which gives me so much joy. Thank you both a LOT. Can't wait til February...and I'll be stalking the quilt store for your new line of fabric! I really love the new piece! I'll definitely be looking for your new book too. I can't stand it, I love everything both of you do... have done many of your projects and always look forward to see what is coming next! I live near Spring Green and regretfully, couldn't attend the latest workshop, but live vicariously through Jeanne's weekly newsletters and your blog. Love the new AotH - I can't wait for some stitching time - only more days of school and then freedom! Oh, I can't wait to see your new book. I have been envious of those who have had the opportunity to take your classes. I am excited about your new book. I am also waiting for the quilt pqttern for the fall/halloween quilt from the Class At Quilter's station. Can someone tell me when that will be available? Oh, would love to attend Country Sampler someday. Sounds awesome. Glad you had a good trip..
Love the new design and can't wait for the new book...since Feb. is my birthday it will be a perfect present! Thanks for doing this! Love the new design. It is sweet! Oh, I can hardly wait for Feb to come, it will be a must have for me. I will have to notify Debbie to get me on the list!! That is fantastic that you are doing this, thank you so much. I can hardly wait to get somewhere to see your new line of fabric too. thanks for all you both do, you are just marvelous women. I am so happy you will be making a book of your class projects. I took a class with you and it was a highlight in my life! I hope to take another one someday. Hooray for the book of class patterns! I can't wait! My, what lovely hips you have! Looking forward to the class book. The new AotH is so cool, love the moth and the puppy :-). Can't wait for the class book, I wish I could go to every class you and Barb teach! Just started Clara Ellen and have my order in for the new release. Of course I've also already pre ordered your book of class projects with my LNS. : ) So excited for this one to release. Hoping your last sampler from Boxwood and Berries will be in it!! Absolutely beautiful. But then again I love all your class designs. Have a great weekend! Oh Alma, so much to look forward to..... a new AotH, new fabric and the book in February. I am so excited ! !